Eliot was a genius but I wouldn’t have wanted to spend more than five minutes in a room with her. She’s way too intense. An intense romantic and an intense psychologist. Middlemarch is a period drama which unfolds against the backdrop of a northern market town. It contains its stereotypical misunderstood heroine, spurned lovers, closet hypocrites and those with dark historical secrets to hide. Eliot weaves their lives together in a very complex narrative that spans nearly 800 pages. The genre was very young when she wrote this. By the time Lawrence penned Sons & Lovers, it had matured. By the time Coetzee penned Disgrace, it had moved into middle-age. I prefer the mature period myself. I found Middlemarch to be overlong because Eliot likes to be verbose. Typical of Anna Karenina written slightly after this, the novel needs time to digest the detail. Often you wonder why she’s telling you all this… this… well… this stuff really, and some of her concluding storylines are as easy to spot as a pylon on a prarie which doesn’t help. Having said that, this could be because it spawned so many later novels which I’ve already read. There is some great writing there but, for me, it was just too long winded. I also felt it was a showcase for Eliot’s desire to flaunt her wit and wisdom. For the achievement alone, I rate it good despite it being less than enjoyable to read. The really delightful marriage must be that where your husband was a sort of father, and could teach you even Hebrew, if you wished it. Notions and scruples were like spilt needles, making one afraid of treading, or sitting down, or even eating. A woman dictates before marriage that she may have an appetite for submission afterwards. And certainly, the mistakes we male and female mortals make when we have our own way might fairly raise some wonder that we are so fond of it. If one is not to get into a rage sometimes, what is the good of being friends? to most mortals there is a stupidity which is unendurable and a stupidity that is altogether acceptable – else indeed, what would become of social bonds? guimp: piece of light material used to cover face, neck and chest. chyle-fed: Chyle is a milky fluid (bodily fluid) consisting of lymph and emulsified fats. roan: A coat pattern in which the base color (often red) is mixed with white hairs and looks lightened or mottled. compeer: A person of equal status or rank; a peer. pathos: A quality, as of an experience or a work of art, that arouses feelings of pity, sympathy, tenderness, or sorrow. dithyramb: A wildly enthusiastic speech or piece of writing. hoyden: A high-spirited, boisterous, or saucy girl. benefice: A church office endowed with fixed capital assets that provide a living. cicerone: A guide for sightseers. macerated: To make soft by soaking or steeping in a liquid. roulade: A slice of meat or fish rolled around a stuffing. laches: Undue delay or negligence in asserting one’s legal rights. But since ’tis as ’tis, why, it might have been worse, and I feel my thanks accordingly. I agree with the comment you left on my blog about how reading helps in understanding and relating to people. I certainly didn’t slog through Middlemarch for the fourth time for my personal enjoyment. I also agree with your rating of Middlemarch, because it really isn’t a bad book. As a beloved classic people have enjoyed reading for over a century, I was surprised at my dislike for it and how dull I found it. I think my dislike is purely founded on a lack of understanding, I must have missed something of subtlety and importance. One day I hope to meet someone who *loves* Middlemarch and have them explain to me just why it is such brilliant book. 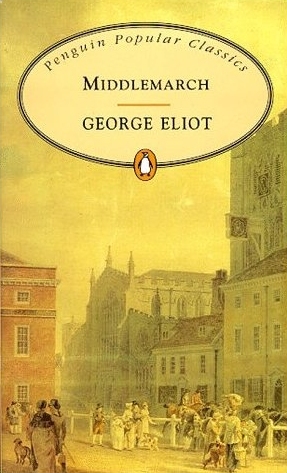 One of the best books ever written in the English language… and you say “over long”. Right. Great review. Yep, that’s what I say. Do you perchance have any more cogent opinion than a one-liner that I can read to convince me otherwise?